The majority of animal locomotion studies have focused on understanding movement on flat, solid ground. Because of the simplicity of the ground, animals often uses only one primary locomotor mode, such as running, walking, or jumping. Thus, such stereotyped, single-mode locomotion is relatively well understood. In nature, terrain is far more complex than flat and solid; animals rarely move in steady state using one primary locomotor modes, but must transition between different locomotor modes. While people have long observed how animal’s behaviors change in response to changes in the environment (e.g., ethogram studies), transitions of modes during locomotion and their underlying biomechanical principles are less understood. To begin to understand locomotion through 3-D, multi-component terrain, we studied the discoid cockroach native to tropical rainforest moving through our well-controlled grass-like beam obstacles. We pick this animal as our model organism because it has to move through forest floor filled with all kinds of obstacles and is likely well adapted to densely cluttered environments. Figure 1. 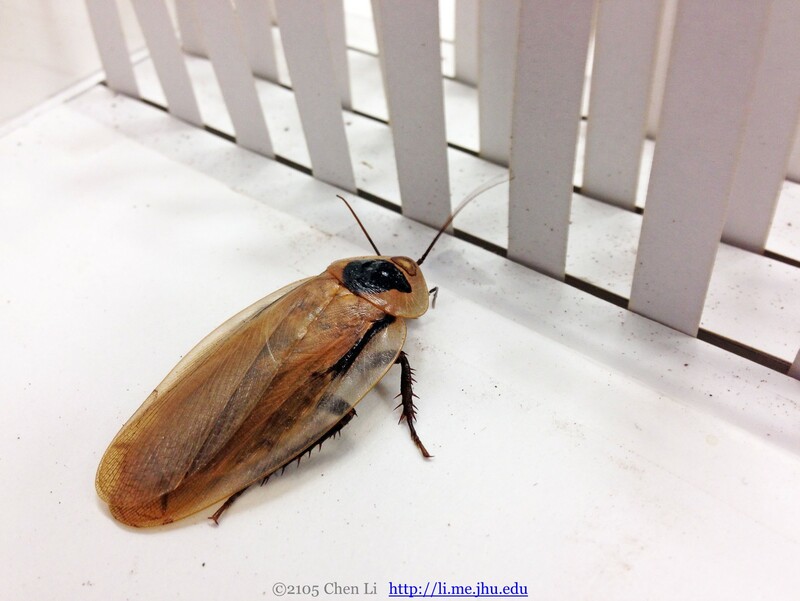 A discoid cockroach standing in front of grass-like beam obstacles. In contrast to single-mode, stereotyped locomotion on flat, solid ground, we discovered that movement in 3-D, multi-component terrain emerges via diverse, complex locomotor pathways (Fig. 2). For example, to go through tall, narrowly spaced, grass-like beams, cockroaches can explore laterally (black), push across (magenta), climb over (green), or even roll their body to the side to maneuver through slits (red). Figure 2. Cockroaches use a variety of locomotor modes to negotiate beam obstacles. In addition, they do not simply use one locomotor mode, but transition among these modes, forming complex locomotor pathways (Fig. 3). This provides a more accurate representation of how animals move in complex terrain ubiquitous in nature. Moving in diverse modes through complex environment is also a major capability that we must advance robotics towards, if they were to truly become part of our daily life. Figure 3. 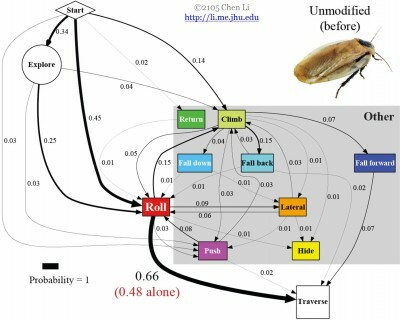 Cockroach’s locomotor pathways towards beam obstacle traversal is dominated by roll maneuvers. Numbers aside arrows indicate transition probabilities. Among all the observed locomotor modes, we noticed a novel mode that is particularly frequent and effective. In this novel locomotor mode, called roll maneuver, cockroaches quickly roll their bodies to either side and maneuver through, even when obstacle gaps are less than half their body width. Thanks to repeatable experiments (~200 trials for 5 individuals) enabled by our new device to control beam obstacles, we were able to quantify in great detail animal’s locomotor mode transition probabilities (Fig. 3) and traversal time. 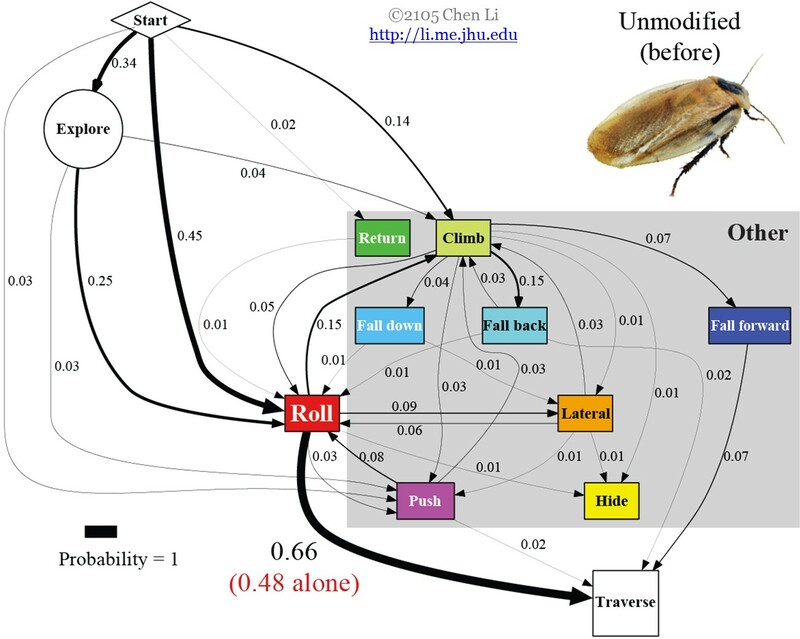 Among the 77% of all trials in which cockroaches traverse, 66% use roll maneuver, taking only about 2 seconds, the fastest among all locomotor modes and pathways (Fig. 4). By contrast, only in 11% of all trials do cockroaches traverse without using roll maneuver, taking about 5 seconds. Figure 4. 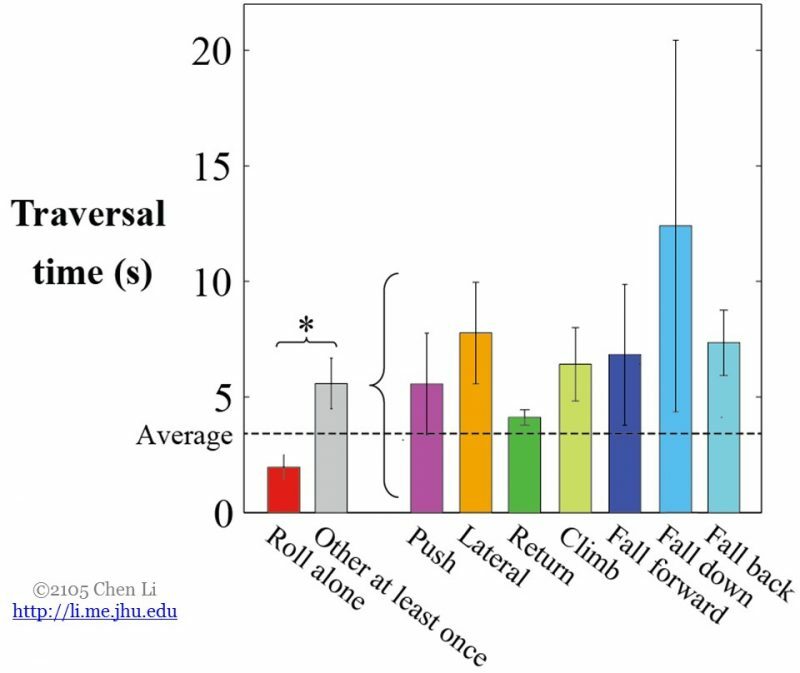 Traversal using roll maneuver is significantly faster than using any other locomotor modes. To test the ability of legged robots in traversing similar obstacles, we tested a cockroach-inspired robot that was previously developed to run fast on flat, solid ground. Even when gaps between obstacles are wider than the robot body width, the robot almost never traverse. Instead, it often changes heading (due to body yaw) after the body hit the beams and becomes stuck within the beam obstacles. Only when the robot run very straight without hitting the beams can it go through without trouble. The failure of the robot to traverse obstacles highlights the need to better understand locomotor transitions and improve robot design and control to make them more versatile, especially in the face of complex terrain. Through testing a new hypothesis inspired by our animal study called terradynamic streamlining, we successfully enabled the robot to traverse beam obstacles, even when gaps are narrower than robot body. What Is Terradynamics And Why Do We Need It? How Do We Create Terradynamics?